Fashion-focused nail polish in a gorgeous array of inspiring colours and effects. Application is quick and easy- one coat of the high gloss formula provides a rich, flawless finish. 8 ml. How to use: Apply on top of a base coat and finish with a top coat for extra protection and shine. 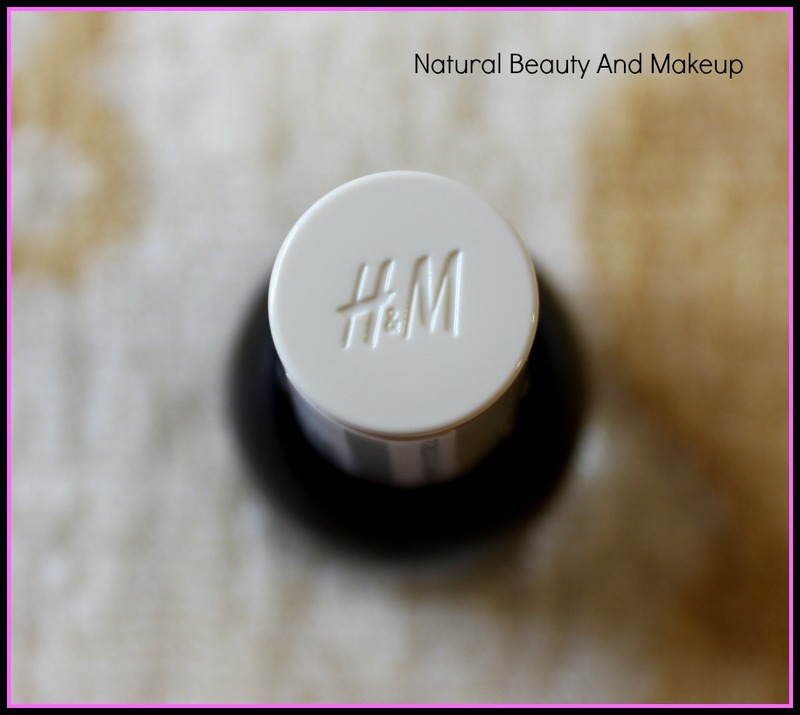 I never knew H&M has cosmetic products until I read a foundation review post where the author mentioned about H&M makeup products. Later when I visited H&M store, I spotted its beauty section and bought two nail paints (red and black) from their zillion shades at a super affordable rate!! 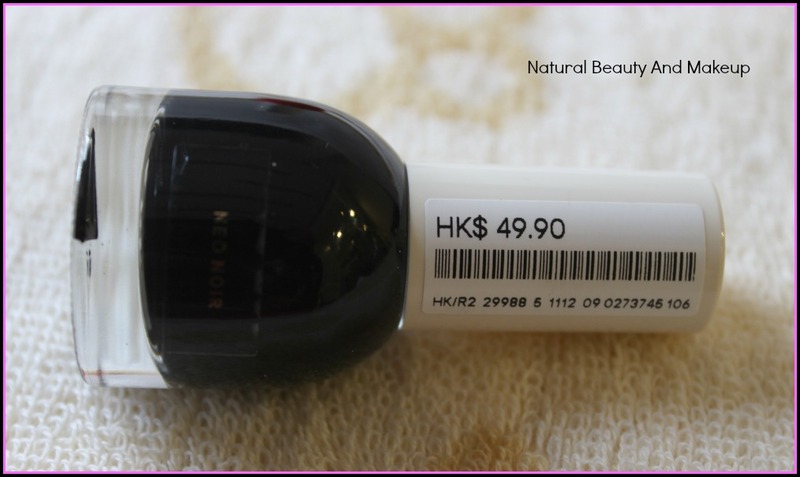 Neo Noir black nail polish comes in a curvy, 8ml, see-through black and white glass bottle with a wonderful applicator. The shade name is written on a plastic scotch tape which is further attached to the back of the bottle. All H&M nail polishes have the same packaging, nothing fancy. The consistency of this nail paint is runny yet creamy. I am super happy with its glossiness factor and above all, it has no artificial fragrance! The application is super smooth (no streakiness) and all credit goes to its wide and flat brush, which gives the maximum coverage in just one swipe! Out of all the nail polishes I've tried so far, this is the best and I must say, its applicator is undeniably the X-factor of this nail paint. The colour of this Neo Noir shade is jet black and one coat (read one coat) is sufficient to give you an opaque black painted nails. I never needed further layering it but if you feel that urge, you can proceed with another coat. 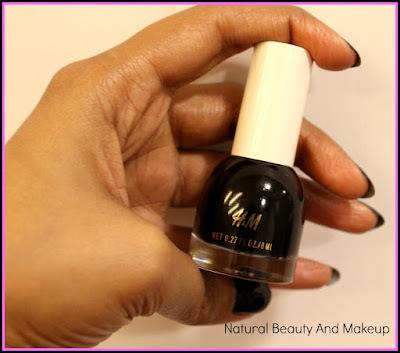 I don’t fall under avid top coat and base coat followers category, so this review is fully based on simple application of nail paints sans top/base coat. On my hands, it stays for up to two days without any chipping or damage but on my toenails, this nail paint survives for an entire week!! Now, I can’t blame it because I do everything from doing the dishes to cooking at home! Moreover, I prefer keeping my hand nails bare except on weekends, so I am fine with its 48 hours durability. Although, after a few days, this starts to wear off from the cuticle area of my toenails but is totally negligible. This nail polish is easy to remove also; it doesn’t leave any dark stain on the nails post removing. As I said, I don’t apply top/base coat, I do believe that with them this would look extra glossy and stay for a long period of time. Well, I am happy with its staying power but to some, it might be an issue. However, this can be sorted easily by following up with top and base coats! 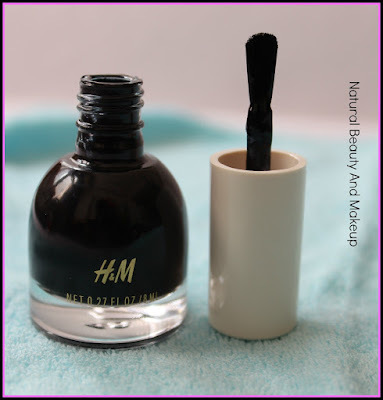 H&M Neo Noir shade is a beautiful, deep black nail polish which is easy to use, affordable as well as gives a rich, glossy, flawless finish to the nails. 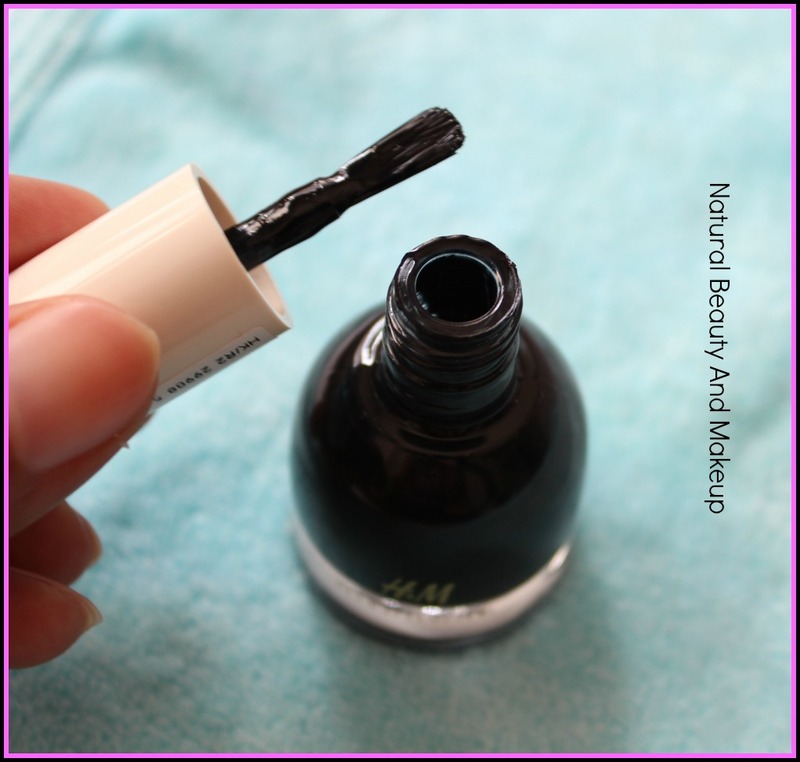 If you love creamy dark colour nail paints, you need to try this out! I am yet to try the red (Parisienne shade) one but as of now, I am super impressed with this black shade and wish to buy more nail paints from this brand in future. 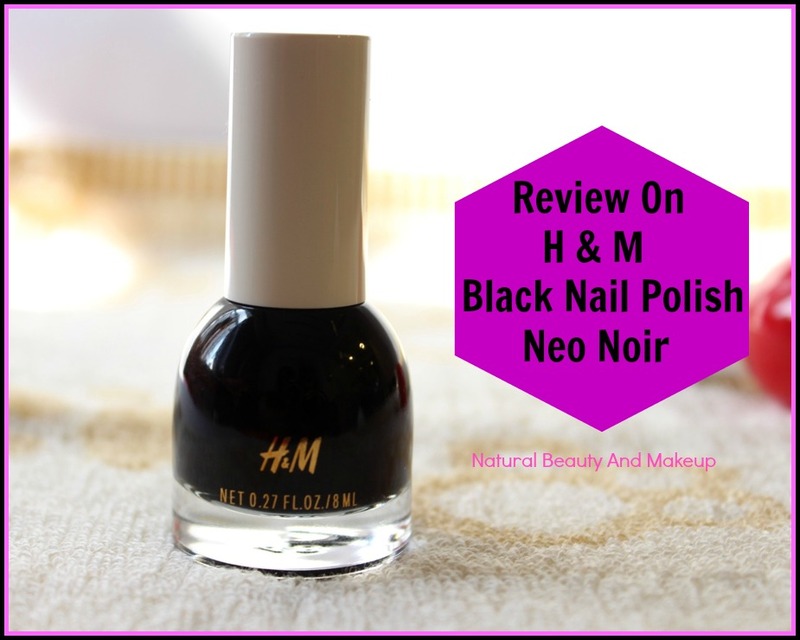 Have You Ever Tried H.M Neo Noir Black Nail Polish? If Yes, Then Do Share Your Experience With Me In The Comment Section Below. This is a gorgeous black shade dear.. The swatches looked wonderful. I am not much of a black nailpaint person though! To add to my woes, no H&M in Kolkata :-( But had visited their outlet in Chennai once and was mesmerised by their collection. Wow H&M has cosmetic products! Thanks for this info. I will be digging into the store soon. 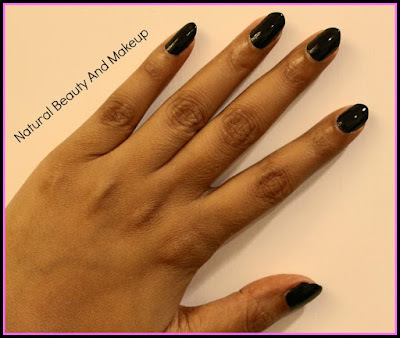 Black color is always in my 1st opt for nail paints, how it can become so gorgeous in one or two stroke of paints. I love black nail polishes too..! As it has a great quality, i would love to try this out ! Interesting. This is new to me. Really? 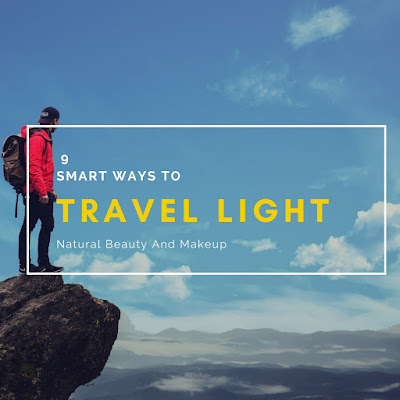 You can give this a try Lisa :) I am sure you'll love it!! 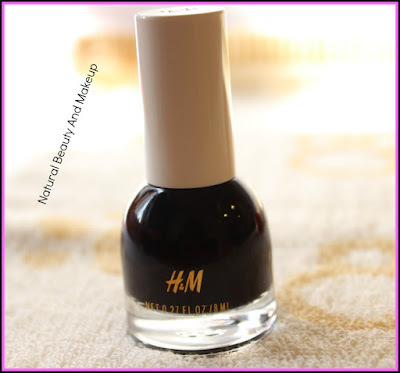 This looks good, I didn't know H&M has nail polish. I go there every week and haven't see it. Thanks for the info and review dear! Definitely going to try this as soon as Kolkata has its own H&M! I love dark shades, this one definitely is my take. I was not able to post comments, it was giving some error...anyways loved th tiny bottle and perfect black.. I have never used black nail paint, never! This one sounds great! Loved your review Ana! I remember when I was in school and wanted black nail polish they were so hard to get. Now they are everywhere. This one from H & M looks good.